I’m getting on that list asap. Love the idea but the big appeal is the ultra pocket-ability. Unless it outperforms desktops with your setup (That would be cool) and I wouldn't be too surprised the Dyna Vap is Dynamite in my opinion. Induction Wow. 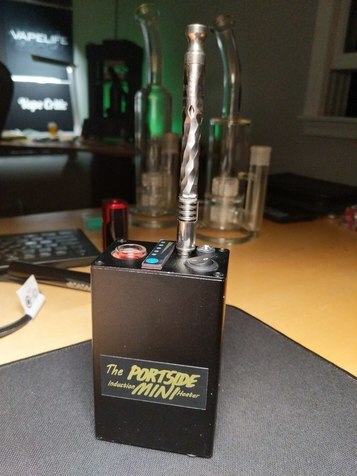 The mini portside is awesome. Loving mine. Changes the whole dynavap experience. What ever happened to DyanVap's development of an induction heater??? Dynavap has another announcement tonight. And they have been talking about new and exciting products coming out. So maybe tonight they will shed some light on it in their live stream or maybe they have colored titanium or something else. I kind of like the way you can pick your temp by where you hold the lighter. From the way this is set up you only get one heat level since it is triggered by a switch inside the heater. My thought is that's like running your car at full throttle all the time. so i noticed you are continually pushing the vapcap down on the button for the duration of the heatup. i thought you could just put the vapcap in, push to trip the button and then release until it's heated. are all the current ih varities setup this way. i really want one where you just sit the tip in the ih unit and wait for the click without having to physically hold the vapcap down with pressure. Hi Warren....I'm fairly sure its just a push to actuate....kind of a safety feature...rather like a dead man switch. You stop holding it down, it turns off. @VapeCriticyou prefer the portside over using a torch? Would you consider PSM to be a must have for dynavaps? @VapeCritic Which of the 2 heaters you have used so far so you prefer? What's up @VapeCritic. I also received one of these recently. I'm really digging it. For me it makes for the perfect DynaVap hit. I got pretty good with the torch but this makes it nearly automatic! @Baron23 I asked recently and they said they were having some issues with it. I suspect that put it on the back burner until they make it through the holiday season. Thanks, mate....yeah, its been hanging out there for a while and I can't think that its too very hard of a project for an electrical engineer.....but perhaps harder to do than it appears. thanks baron ... not sure i like that feature but i think some of the other builders don't have that? @VapeCritic, Pipes says you should test the load in use. Engage the battery charge indicator & then heat the vc to see your charge level under load. With my PS, even though all the 3 blue lights are lit up when the battery tester is checked without load, under load, I'll only have1 blue light. When it winds up on green or red, I'll recharge. "Just let it get a few minutes worth of charge first if the batteries are completely flat. I determined it takes about 80 mAh of power per bowl. Based on an 800 mAh battery giving an average of 10 sessions per charge and 4 heat ups per bowl. Therefore, it takes around 20 mAh per hit. Now the charger charges at 1000 mAh or 16.7 mAh per minute. So, this means it takes 1.2 minutes to recover after a heat cycle or roughly 5 minutes to achieve enough for a session." HahHa Nice. I have a different version and works great! I wouldn't say the Portside specifically is a must-have cus any IH will do the job, but it seems to be a well-made product. The only thing that isn't amazing is the battery life, it's died on me a few times in the middle of a session before I expected it to, so I would keep the charger nearby. You can use it while it's plugged in and charging, but if the unit is completely dead you'll need to give it a ~5 minute base charge before resuming your session. See @Summer's comment above for an explanation of this from Pipes himself. The few times this happened to me I've just taken out the lighter for a few draws while it charges, then by the next load the Portside battery has enough juice to power the entire session. Looks like my Fluxer induction heater is shipping tomorrow. I'll post up some pics and tell what I think after i get it. You know, I really can't help wonder if my Jarhead IH somehow doesn't work right. Had it 2 years and I never use it. I gave up on it pretty quickly, I just didnt get good performance. The load is always toasted unevenly, brown on top with increaingly bad flavour without stirring, with green underneath still. I have to go past the click at least 2 seconds to get decent clouds, and taste and vapor is unpleasant to me compared to a torch. I combusted way too many times too with the IH, seeking that line. I just prefer the performance and extraction I get with the torch. Perfectly even-browned ABV, no stir. 3 or 4 heat cycles, first 3 equal big hits. Better taste than my IH. So I dont know. Bud clearly loves his IH's. I know you can adjust how long it takes to reach click by how deep the glass tube sits in the coil. I should push mine deeper and see if it improves things. I do know of at least one other member who had the same experience.